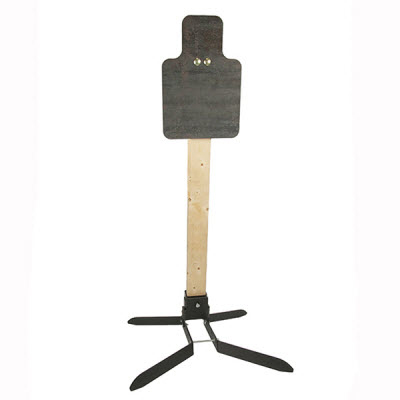 Heavy duty Pivot Stand allows for both static & reactive target options. 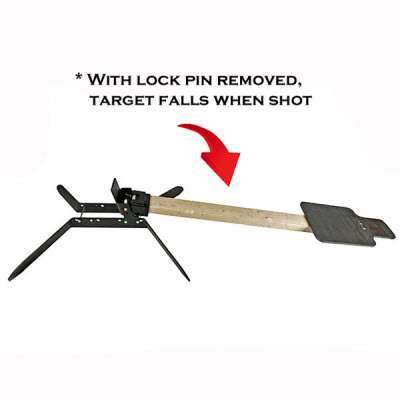 Turn the target into a knock down target by removing the locking pin.  Includes heavy duty base designed for Law Enforcement, Military & Commercial use.  Torso target easily slips on and off standard wood 2 x 4's (not included).  Adjustable "pitch" factor for various calibers.  Target is reversible for extended life and stand comes standard with an all weather powder coat finish.  Minimum safe distance of 7 yards.  Leans forward up to 30 degrees to keep splatter to the ground. Weighs less than 40lbs Stand dimensions: 24" x 22" x 9"